I've mentioned before that I have a passion for early childhood education. In particular, I'm passionate about the movement beyond a heavily-structured, academic-based education system for young children, into a system that focuses more on self-paced discovery and creativity. I've recently been reading up on introducing and incorporating art into a toddler's day-to-day life. Inspired by some recommendations from The Artful Parent blog (which you really should check out, as it's brilliant), I purchased Young at Art and First Art from Amazon. 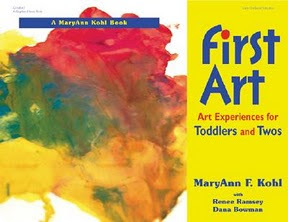 The positive - This book explains some really innovative ways to introduce art to young children. The author also lists supplemental books, songs, and activities that would help one form a complete preschool art curriculum. The negative - I found the author's tone unpleasant and rather artier-than-thou. It seems as though Striker's opinion is that there is one correct way to go about introducing and implementing art in a child's life, and anything else is forbidden. Her list of rules is full of "never"s and absolutes, two things that make me cringe when speaking of working with children. "After freely experimenting with the materials, the child may have felt that he had done something wrong. Otherwise, why would the teacher have found it necessary to alter his work so as to make it unrecognizable? Any painterly effects the child may have made were totally obliterated when the teacher wrote his name over the front of the picture. Even if the rest of the picture had been left alone, the teacher's addition of the written word would have been enough to alter the design and placement of the original work. [...] Taking scissors to the completed painting is an attack on the child and his or her sense of self-worth." That's an awful lot of projecting Striker is engaging in on the part of the child, not to mention the gross generalizations she's making regarding children's emotions. Her inflammatory language does nothing to drive home her point that free-form art is more valuable than product-oriented projects for young children. Instead, it only serves to alienate and guilt parents who may occasionally engage their children in activities designed to "make something." Aside from the off-putting tone, this book could do with some serious editing. The author repeats the same information and opinions ad nauseum. Had she cut down on all the proselyting of her One True Way and stated each point only once, the book could have been a nice-sized pamphlet. The verdict - The formula for art introduction in this book is intense. One is to introduce colors in a specific order, discuss art in a way that does not always come naturally to the average person, and be ever vigilant not to stifle "creative urges" like coloring on the walls or painting a brand new scooter without permission. 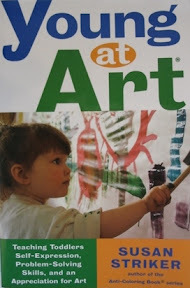 I imagine if one is interested in raising an art prodigy, the lessons in this book would serve them well. For those of us who just want some new ideas of ways to make art accessible and fun for our kids, wading through the preaching is wearisome. I tend to feel that if something I'm doing with my child is taking an inordinate amount of effort on my part, I'm doing it wrong. In every area that Young at Art let me down, First Art made up for the deficit. The style is well laid out and succinct. Chapters are arranged by type of art (paint, dough and clay, drawing and marking, sticking and gluing, making prints, homemade props), and projects are arranged in order of complexity. Each project clearly lists materials needed, outlines the adult's role in preparing the project, and includes tips to make the project more successful. The projects are fun! From the very basics of introducing finger paints in an engaging way for toddlers, to making bubble prints, this book gives a multitude of ideas for making art accessible and engaging to little ones. Kohl's opinions about art and children are actually similar to Stiker's in many ways. Both believe in process over product, providing materials and allowing children to take the reigns, and making art an everyday occurrence in the home. Kohl just manages to share her thoughts in a way that empowers and encourages rather than Striker's style of telling parents every way in which they're screwing their kids up. I'm eager, now, to have a go at some more of Kohl's books. Doesn't Big Messy Art sound awesome? Do you have any recommendations of children's art books/blogs/websites to share? Hi, Karissa. I really enjoyed your review of the two art books for young children, and am pleased you like First Art. Like the other author, I feel the exploratory process of art is best for kids. But I also think a sprinkling of fun little craft projects for holidays and "now and then" is fine too! All of the "nevers" you mention are important, but I never say NEVER. Just rule of thumb, as in all things, moderation is the key, not absolute rules. So thank you so much for your great review, and thank you for understanding that crafts for young children are fun once in awhile but should not be their complete art program. This is their chance to find out how their "art world" works on their own terms. There's plenty of time for all the rest as they grow. But of course, hearts for Valentine's Day and all the other little cute things you mentioned are fun too. I forgot to say, "Please visit my blog!" And my webpage lists my other favorite blogs which are all about art for kids. Thank you so much for weighing in, MaryAnn! I've been so inspired by reading First Art, and I can't wait to share the art experiences it holds with my daughter. You've really given us a gift. I'm also eager to explore your website and blog now.